For more gluten-free potluck ideas, check out our class offerings, held throughout the year. In a medium saucepan, bring the 2 cups of water to a boil. Add the salt and quinoa. Lower heat to medium low, cover, and cook for 15-20 minutes, or until all the water is absorbed. Remove from heat, and allow quinoa to cool completely before preparing the salad. To prepare the dressing, combine the olive oil, lime juice, garlic, chipotle pepper, adobo sauce, and cumin. Whisk until combined. 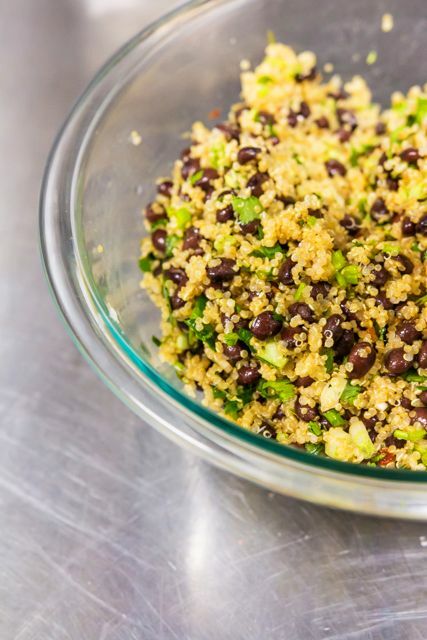 Mix the dressing with the cooled quinoa, black beans, cilantro, and green onions until well combined. Serve cold or at room temperature. Note: Look for chipotle peppers in adobo sauce in the international or Hispanic foods section of the grocery store. Small cans often sell for less than a dollar. The chipotle peppers are packed in the sauce, so you get both ingredients in one can. If you have leftover peppers and sauce that you won’t use right away, you can freeze them for later use.